Happy February. So much is going on for it being right after Christmas! I am enjoying my crafting but have not had a lot of time to devote to it! I hope all of you have found extra time for yourself and avoided getting sick!!! 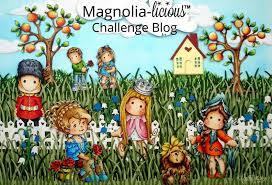 Come on over to Magnolia-licious Challenge Blog and submit your creations for our February challenge!!! We love to see all you are doing. Here is my challenge card. This is Tilda with Spring Heart from the 2013 collection Lost and Found. The clouds, tree, and grass are dies from Lawn Fawn. Colored with colored pencils. This sweet Tilda is my inspirational card for this month. I am partial to some of the older Tilda stamps and Shawn has some of these in stock! I love the 2010 Easter Collection and the 2011 Winner Takes All. I promise you will fund bunches of stamps and they are on sale! Finally, I had to wait a little while to share a card from January. I made it for someone special who follows my blog! I wanted it to be a little bitty surprise. This is one of my new favorites. It is Birthday Tilda from the 2011 You are Special collection. She is colored with Prismacolor pencils. There are glitter highlights that are hard to see on the background cake, and candles. Paper and ephemera are from the It’s a Celebration paper pack by Carta Bella. Happy birthday again Jodie! Wishing all of you a wonderful day and a LOVEly month. I am going to celebrate love all month! Take some time for yourself…it is important! Karen, these cards are amazing, wonderful work! !